One of the major frustrations of living abroad is that you never get fresh rice noodles. All the rice noodles you see are dried versions that you have to boil in water. But as all rice noodles connoisseurs know, these taste bland and they are so brittle that they are impossible to cook with. But fret not, here is a simple recipe you can use to make your own rice noodles at home! It is proven that rice noodles originated from the southeast of China, before it spread to the other parts of East, then Southeast Asia. 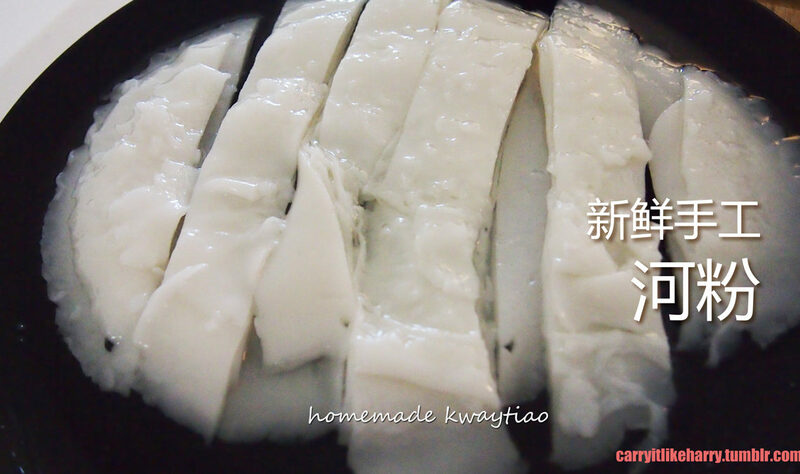 The inventors of the flat rice noodles are the Hokkien or Minnan 闽南 people. Their cultural sphere encompass the current southern half of Fujian 福建province and the whole of Taiwan. Their linguistic cousins, the Teochews 潮州, who live in the Chaoshan region of neighbouring Guangdong (Canton) province are also masters in making the same rice noodles. With the Teochew diaspora in Thailand, rice noodles spread there and the Thais adopted it with the same name ‘kuai tieu’ ก๋วยเตี๋ยว . In Vietnam, which was very much influenced by Chinese culture centuries ago, the name for the same rice noodles is very similar: Hủ tiếu. In Singapore, due to the large Hokkien and Teochew population there, a stir-fried rice noodles dish called ’Char Kway Teow’ became a national dish. The Cantonese in Guangdong 广东 province and Hongkong also have the same version of the rice noodles, which they claim to be theirs. Loosely translated as ‘river dough’, the original name of the Cantonese version is actually Sha Hor Fan 沙河粉. According to Cantonese legend, this dish originated in the town of Sha Hor 沙河 (or ‘Sandy River’). 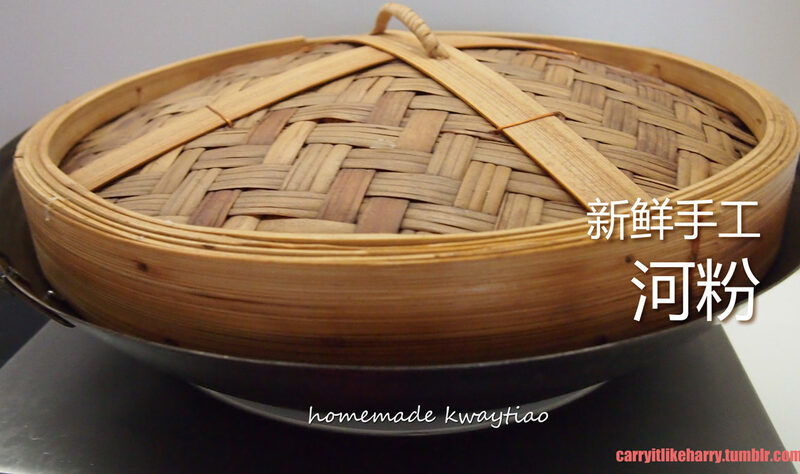 To buffer their claim as the inventors of the rice noodles, the Cantonese say that the only edible Hor Fan is the one made with rice grown in Canton and spring water from the Baiyunshan mountain 白云山. In 2004, the Guangdong government even issued a certificate of origin for Cantonese rice noodles so that consumers can be sure they are not buying inferior versions from neighbouring Fujian. Another group laying claim to the origin myth of the rice noodles are the Hakkas 客家. Hakkas are northern Han Chinese who have moved into Canton centuries ago. In the cold north, the Han Chinese eat wheat – which they harvest only once a year – and wheat-based noodles as staples. In the sub-tropical southeast Canton, they eat rice which they can harvest several times a year. So, it is very likely the idea of noodles originated in the north and was brought by the Hakkas to the south. Mix your flour with water evenly. Make sure there are no bubbles. Heat up your wok with water for steaming. Place your steamer stand in the centre. Pour a ladle full of flour mixture into the metal place. If it is too little, your noodles will be too thin. If it is too much, your noodles will be too thick. I try to maintain it at 3 to 5mm. Place the metal plate into the wok, cover and steam for 3 minutes. Once you see the centre of the noodle cake rises into a bubble, that means your noodle cake is cooked. Take your metal place out of the wok and plunge it into a basin of cold water. 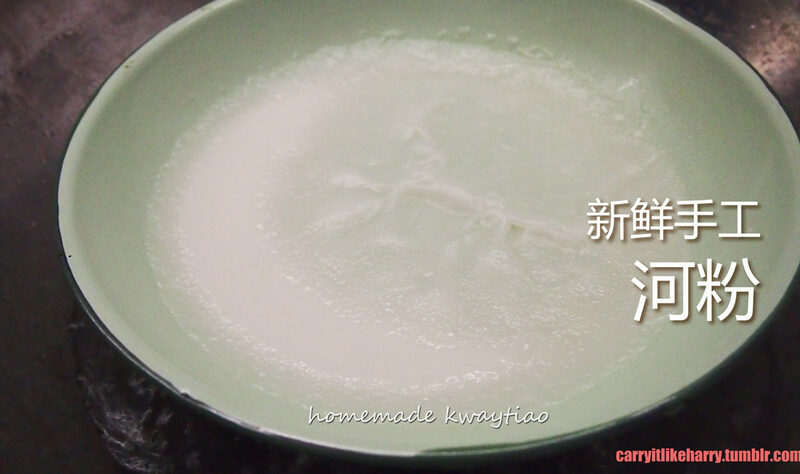 Slowly remove the noodle cake with a spoon, be careful not to tear it. Place your noodle cake onto a well-greased plate. 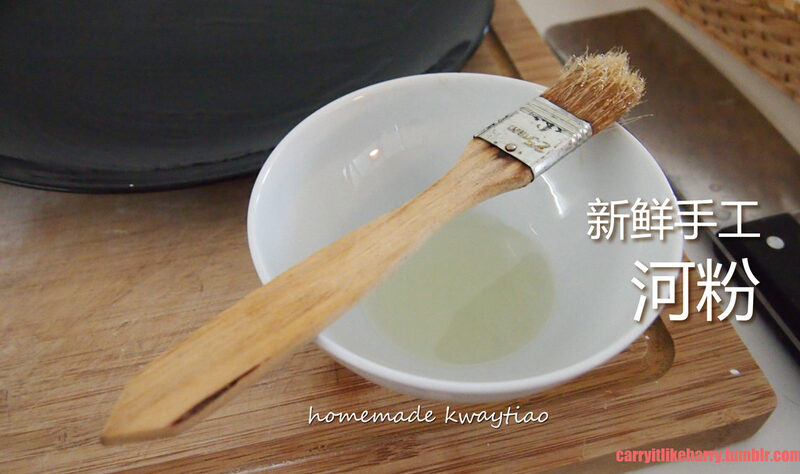 Brush your noodle cake with generous amount of vegetable oil. 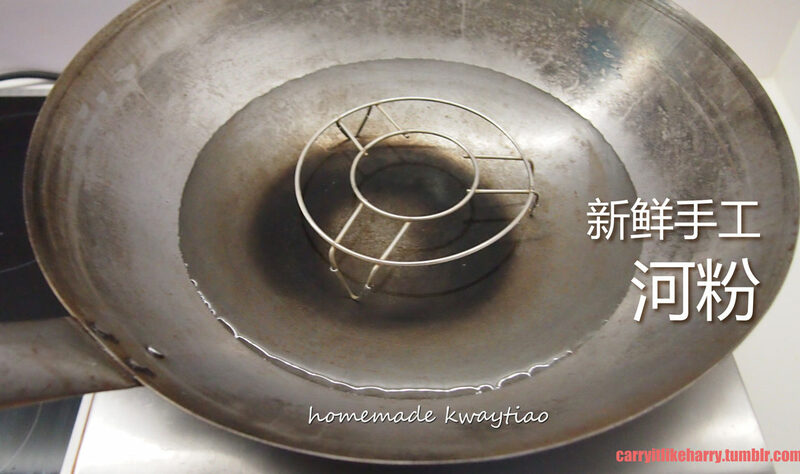 Clean your metal plate well before you continue to make another noodle cake. Repeat the cooking process until you have exhausted the flour mixture. With layers of noodle cakes stacked onto one another on your plate, cut them into equal breadth with a knife. For Hokkien style kwaytiao, they are normally 3cm wide. For Cantonese style horfan, they are about 6cm wide. Place them in a container and mix them around (add more oil if necessary) so that the noodles strands do not stick to one another anymore. Cover up and you can place them in the fridge if you do not want to cook them immediately. Recipe ideas: Try my Ipoh Shredded Chicken Rice Noodles 怡保鸡丝河粉! 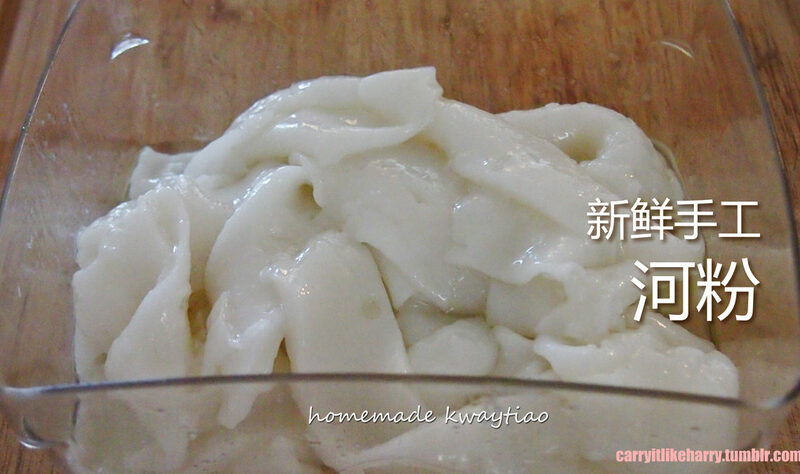 Should you not use add tapioca flour, the resulting noodles will be extremely brittle. 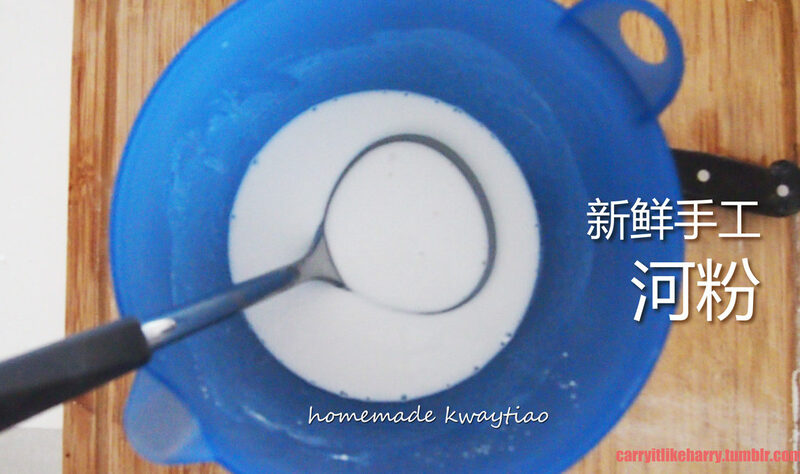 You can replace tapioca flour with either corn flour or potato flour. 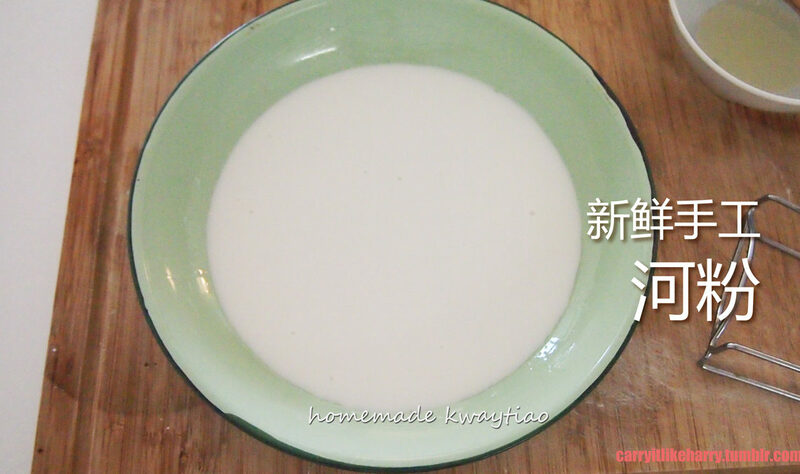 For Vietnamese style noodles, use corn flour. Your metal plate needs to be completely flat, otherwise your rice noodles will not have an even thickness. Do NOT grease your steamer plate. This will result in bubbles in your rice noodles. I wish you could type your recipes in recipe card format so that it is easy to read and print. Hi Harry! I’m so happy I stumbled across this, thank you so much for sharing! I’ve been looking for a way to make ban tiao but lack the knowledge and language skills to find instructions for anything that resembles the noodle soup I remember eating as a kid. If I had known when I was younger that not knowing Chinese would be an impediment to delicious food I would’ve worked harder to learn it 🙂 Your other food and recipe posts look amazing by the way – please keep writing!